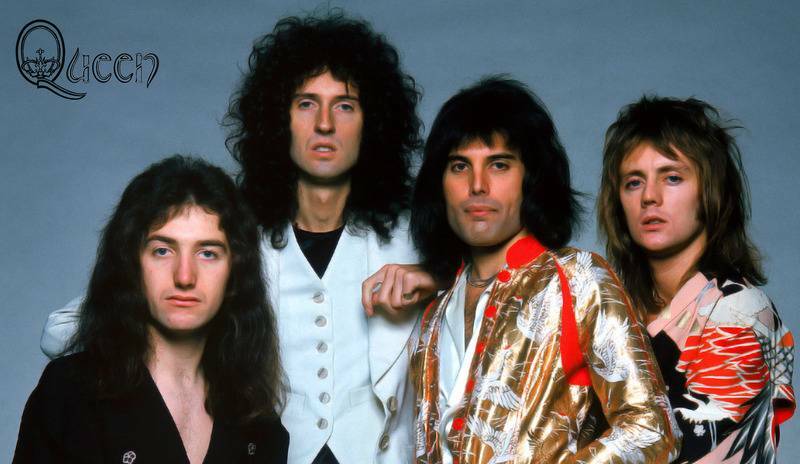 Queen are a British rock band formed in London in 1970, originally consisting of Freddie Mercury (lead vocals, piano), Brian May (guitar, vocals), John Deacon (bass guitar), and Roger Taylor (drums, vocals). 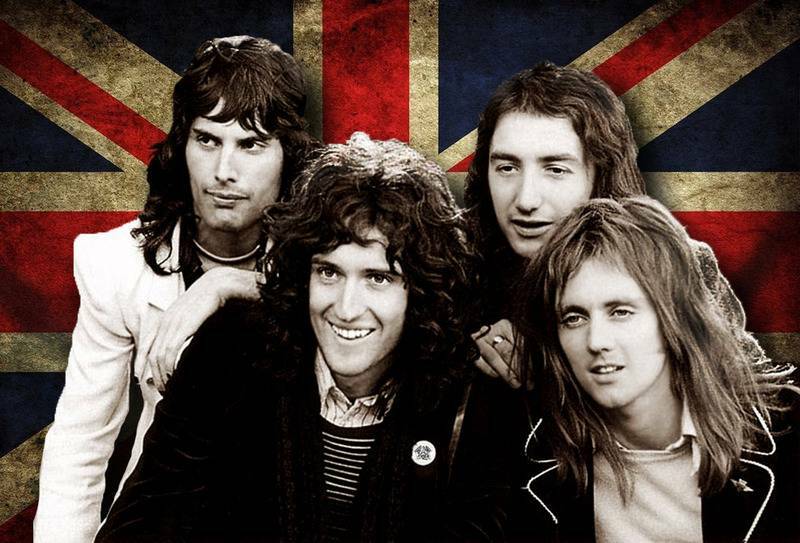 Queen's earliest works were influenced by progressive rock, hard rock and heavy metal, but the band gradually ventured into more conventional and radio-friendly works, incorporating further diverse styles into their music.Before joining Queen, Brian May and Roger Taylor had been playing together in a band named Smile with bassist Tim Staffell. Freddie Mercury (then known by his birth name of Farrokh "Freddie" Bulsara) was a fan of Smile, and encouraged them to experiment with more elaborate stage and recording techniques after Staffell's departure in 1970. Mercury himself joined the band shortly thereafter, changed the name of the band to "Queen", and adopted his familiar stage name. John Deacon was recruited prior to recording their eponymous debut album in 1973. Queen enjoyed success in the UK with their debut and its follow-up, Queen II in 1974, but it was the release of Sheer Heart Attack later in 1974 and A Night at the Opera in 1975 that gained the band international success. The latter featured "Bohemian Rhapsody", which stayed at number one in the UK Singles Chart for nine weeks; it charted at number one in several other territories, and gave the band their first top ten hit on the US Billboard Hot 100. Their 1977 album, News of the World, contained two of rock's most recognisable anthems, "We Will Rock You" and "We Are the Champions".By the early 1980s, Queen were one of the biggest stadium rock bands in the world, with "Another One Bites the Dust" their best selling single, and their performance at 1985's Live Aid is regarded as one of the greatest in rock history. In 1991, Mercury died of bronchopneumonia, a complication of AIDS, and Deacon retired in 1997. Since then, May and Taylor have occasionally performed together, including a collaboration with Free and Bad Company vocalist Paul Rodgers under the name Queen + Paul Rodgers which ended in May 2009. Since 2011, May and Taylor have collaborated with vocalist Adam Lambert under the name of Queen + Adam Lambert. In late 2014, Queen will release a new album, Queen Forever, featuring vocals from the late Freddie Mercury.The band have released a total of 18 number one albums, 18 number one singles, and 10 number one DVDs. Estimates of their record sales generally range from 150 million to 300 million records, making them one of the world's best-selling music artists. They received the Outstanding Contribution to British Music Award from the British Phonographic Industry in 1990, and were inducted into the Rock and Roll Hall of Fame in 2001. 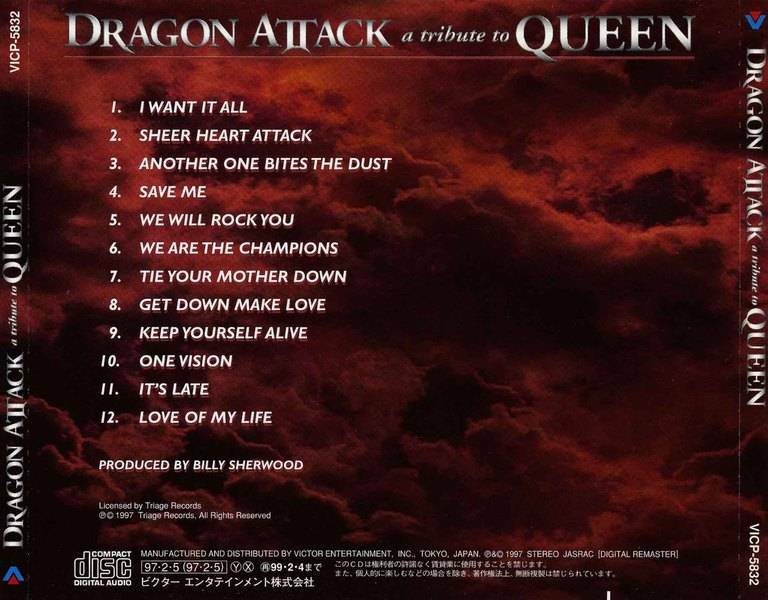 Dragon Attack: Tribute to Queen is a Queen tribute album produced in 1997. Like most tribute albums, it features cover versions of many Queen songs by various artists, but uniquely the songs are not performed by established groups. Instead, the album is performed by a group of musicians who normally perform with other groups or artists, in different combinations for each track.Notable artists featured on the album include Yngwie Malmsteen, John Petrucci, Robby Krieger, the Kulick brothers and Lemmy. 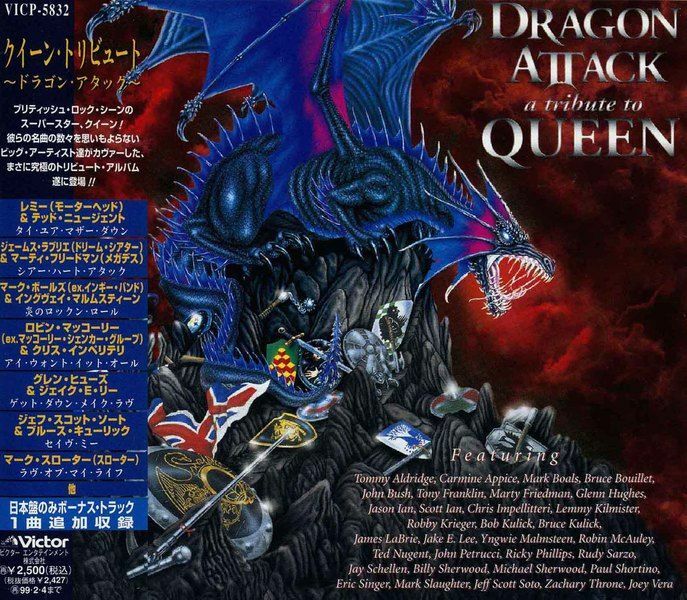 The musicians involved come mainly from a metal background, having performed with the likes of Motörhead, Deep Purple, Impellitteri, Meat Loaf, Kiss, Alice Cooper, Dream Theater, Megadeth, Quiet Riot, Hawaii, Cacophony, Ozzy Osbourne, Whitesnake and Black Sabbath.The album was re-released in the UK as Top Musicians Play Queen: The Collectors Collection with "Keep Yourself Alive" omitted and a 2010 recording of "Bohemian Rhapsody", with John Wetton on vocals, added.Chris Impellitteri is incorrectly listed on the cover as 'Chris Impelletteri'. The folks behind previous Jeff Beck, Ace Frehley, and Stevie Ray Vaughan tribute CDs deliver a fourth laudatory project, which pays its respects to the estimable Queen catalogue while allowing an all-star lineup of hard-rock guitarists to get their fret-hopping jollies. The list of string-benders includes Megadeth’s Marty Friedman, Anthrax’s Scott Ian, Dream Theater’s John Petrucci, former Doors-man Robbie Kreiger, Kiss veteran Bruce Kulick, and Jake E. Lee (ex–Ozzy Osbourne).It’s disappointing to see only two selections culled from the band’s first five albums, but those pre–“We Will Rock You” selections are the best of the bunch. Swedish speed demon Yngwie Malmsteen rips it up right on the Brian May–penned “Keep Yourself Alive”, and on another May rocker, “Tie Your Mother Down”, Ted Nugent does the damage while Motörhead’s Lemmy Kilmister provides his inimitable croak-growl of a vocal. “Hello Brian,” he tosses in at the end, “hope the words are all there.”A portion of the proceeds from Dragon Attack goes to the Mercury Phoenix Trust, the London, England–based charity that fights AIDS in the memory of Queen vocalist Freddie Mercury, who succumbed to the disease in 1991.